Random Ridiculous Rants: This week in stupid lawsuits: Stupid attempts at class actions. This week in stupid lawsuits: Stupid attempts at class actions. Now I'm sure you've all heard that there's a company out there threatening to sue McDonald's, because Happy Meal toys trick kids into wanting Happy Meals and Happy Meals are BAAAAAAAD for them. And while I do think better parenting would fix the solution, that's not even the winner for stupid lawsuits in the food category. The winner, would be Ms. Payton McClure, of NYC, who is trying to get a class action together against General Mills, and more specifically, Fruit Roll Ups. 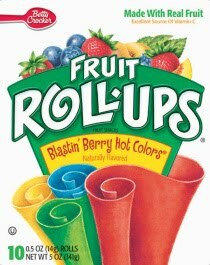 Ms. McClure claims to be a lifelong consumer of Fruit Roll Ups and has recently discovered, SHOCKINGLY! ... that these snacks are not actually health food? WHO KNEW? According to her complaint, Ms. McClure alleges that General Mills failed to properly disclose that its fruit products contain partially hydrogenated oil. Excuse her? Has she ever actually SEEN a Fruit Roll Up ... strawberries don't naturally come like that m'dear, it takes some processing. And second of all, I'm pretty sure General Mills discloses the ingredients of their product every time they produce a nutrition label, which is on every little last box out there, courtesy of the FDA. The complaint stated that use of the oil cause marketing over the past 6 years to be "false and misleading." General Mills is alleged to have advertised that its fruit snacks were "nutritious," "healthy to consume," "naturally flavored," "low fat," and "a good source of Vitamin C," and thus deserved premium prices. Ms. McClure it's called advertising. They are TRYING to sell you their product. They are not going to say "See this gummy like fruit-ish product, it's mostly oil and byproducts" ... Instead they say it's "nutritious and healthy to consume" which it is, it really only needs a comparison snack, such as "potato chips" or "a stick of butter." And actually, I don't even think that's fair to potato chips, since I've seen even those advertised as healthy recently. My favorite advertising for Fruit Roll Ups is THIS video, which clearly shows all of the supposed outrageous lies General Mills has been telling Ms. McClure. The other winner for stupid lawsuits this week comes in the form of a law firm, as opposed to an individual. Kershaw, Cutter, and Ratinoff (who previously filed a suit regarding Farmville... that's right, as if the facebook app didn't get enough coverage in life) has decided to try and drum up a class action suit against the iPhone4. For what you may ask? Have they been exploding? And causing traumatic harm to users and those that happen to be nearby? Have they been proven to be an actual cause of cancer? Are people getting iPhone4 shaped lumps in their heads? No, not exactly. Kershaw, Cutter, and Ratinoff want to commence a class action against Apple and the iPhone4 based on dropped calls and spotty service. Which to me, if not most people, would seem like a reasonable risk in a cell phone. Not to mention that pretty much every iPhone4 buyer out there purchased his or her phone, sight unseen! Go figure... a new device might have some bugs that need to be worked out. Could this be reasonably common with new consumer technology? NO! It must needs be deviousness on the part of Apple! SUE! SUE! SUE! Well, that's it for me this week. Be sure to let me know if you hear of other stupid lawsuits going on out there in the big, bad world of lawsuit happy hipsters. Interesting rants. I have added your blog to my Blogger's Cafe: http://avarchives.blogspot.com/ in Library 1 - Rants. Hope you get a few more readers from the listing. Maybe if General Mills had spelled it "Froot", Ms. McClure (any relation to Troy?) might have been better informed of the roll-ups' devious nature. Nice read ... Take One Picture.